At Sanmina, we consistently and reliably create the photonic value chain for customers. We have a rich heritage of building microelectronic assemblies that go into circuit packs. We have an equally impressive history of assembling and testing a wide range of fragile and expensive optical components. Our customers count on our skilled and talented manufacturing team to design the right process to build and test these highly-complex optical modules and circuit packs. We have extensive experience with the assembly and optical test systems required to reliably manufacture and test everything from the simplest splice to complete circuit packs. Plus, we continually look for new and innovative ways to improve our processes. 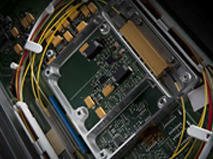 As a result, we make the optical circuit packs for the world’s leading communications network companies.